From Milan Runways, Straight Into The… Kitchen! 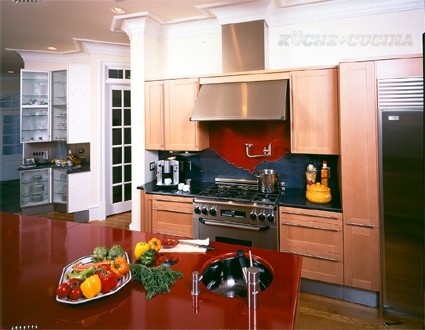 Picture: Pedini Kitchen, NJ – Integra in Grey Oak, Glossy white lacquer and glossy red lacquer. When it comes to choosing a new kitchen, there is a very distinct difference between the American consumer and the Italian one. Here in the US, most consumers know the look, the color, the finish and the material of the kitchen they want in their home. Usually they are actually recreating a kitchen that they saw somewhere before, at a friends or neighbors house or in a magazine picture. They are focusing on a feeling of family, warmth and the good old days. Old World is IN, but…..
More and more, ultra-modern Italian kitchens are showing up in every corner kitchen store in America. It’s not that American consumers have given up the warm and fuzzy feeling of their home décor, but more than ever before some are now ready to open up to a world of new style, at least in their kitchen. They now want what the European’s want: the newest innovations, the most fashionable colors, something that they haven’t seen yet – the next thing! Upscale American kitchens have traditionally been designed using custom cabinetry that can be used in the kitchen, but also in a library, a bathroom or any other space, even in commercial applications. The Italians are designing their kitchen lines to be kitchens from the initial prototype concept. Each kitchen model comes in a few chosen colors or woods, has its own type of unique doors, interiors, countertops, hoods and even its own unique appliances such as a cook top that is shaped to fit into a circular island. The leading Italian kitchens are designed by famous designers and are much closer to works of art then they are to kitchen cabinetry. The other Italian and European manufacturers simply follow the leaders and trust their designer’s tastes and instincts. If they see that a new kitchen model sells well, they’ll produce it in the following year. So, just like in the fashion world, the same colors, shapes and materials are seen everywhere. If you attended the last Euro Cucina (the bi-annual international kitchen show in Milan, Italy) you would have noticed the new trends and fashions everywhere. The leading manufacturers were showing off “this years colors” in their kitchens! The same colors that have dominated Milan’s fashion runways are featured in the kitchens a couple of months later. This season’s colors were everywhere, just as if it was all orchestrated by fashion designers and not cabinet manufacturers… or maybe it was. After all, Italy’s top kitchen designers are really in the fashion business much more then they are in the cabinet business. After “this year’s colors” comes “this year’s woods”. After all we are still talking about kitchens. For 2006, the exotics were back – Zebra, Ebony, and Teak, to name a few, are everywhere, in matte or high-gloss. But not just exotic woods, the good old Oak is still hot, in white, dark grey and natural tones, in horizontal grain and lots of painted glass. The similarity between fashion and cabinetry does not end in the colors and woods. In fashion there are certain shapes or “cuts” that are “in”. 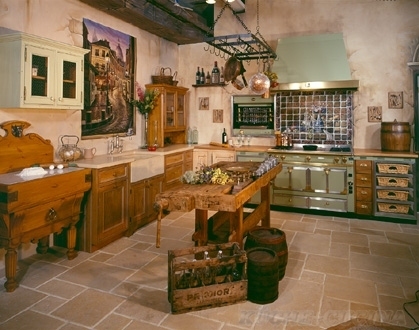 Italian kitchens are no different. In the last couple of years, more and more manufacturers have been showing radius islands and curved cabinets, very thick or very thin countertops and the latest trend – “ribbed” doors. It is interesting that none of these “new looks” is really that new. We have seen them before and they are simply coming back, with a new design twist, a new material or a new finish. There will always be a place for Old World, traditional style. But if you don’t want to be caught dead in last year’s kitchen, maybe you’re ready for a makeover, Italian style. The exotic, the one of a kind, the money is no object kind of kitchen. Years ago, when I was new in the kitchen industry, I met an old kitchen designer from Los Angeles who designed a kitchen for the Warners; the Warners, as in Time-Warner. Bill, the old kitchen designer, told me that forty-something years ago the Warner kitchen cost $1,200,000! I simply couldn’t believe it…How could one kitchen cost that much, especially that long ago? Well, years have passed and our firm has grown bigger and has gotten better. We have won national design awards, our projects have been featured on the covers of numerous national magazines, and we were chosen this year as the Top Design Firm in Customer Value by a national panel of consumers. As a result of this growth and recognition, high-end, special projects are now coming our way. From Saddle River to Alpine, from San Francisco to the Bahamas, more and more customers are commissioning us to create the exotic, the one of a kind, the money is no object projects in the best of places. A kitchen we completed in North Carolina that was featured on the cover of a national magazine has imported enameled lava counter tops. Priced well over $30,000, the lava tops are only a fraction of the total project cost. A few times a year we install custom-made French stoves for our clients. They start at around $15,000 and can go up to almost $100,000 each! 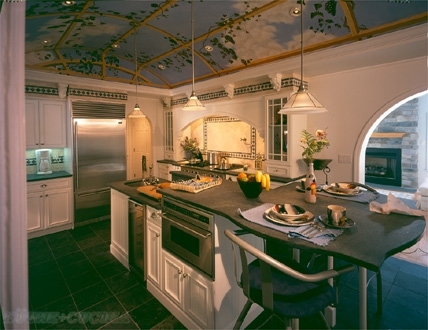 A North Jersey kitchen we did has a mural ceiling, painted by a renowned artist. These murals are becoming popular and can cost as much as someone’s entire kitchen. The rule of thumb ia that the kitchen is about 10% of the cost of your home. So, if someone yu know lives in a $12 million home, maybe they have one of those Warner-like kitchens. In the mean time, i’m still waiting for the Warners to remodel. Picture: Pedini Kitchen NJ with two sinks and dairy/meat sections. A kosher home is an important element in the foundation of Jewish life. Jewish dietary laws, a kosher kitchen is designed to separate items used for preparation and serving of meat and dairy meals. Ideally, cookware, utensils, bowls, and dishes would be stored in separate drawers and cabinets. In order to receive the best design, look for help and advice from a Kitchen Designer who specializes in kosher kitchens. If space and money were not an issue, you might look at a symmetrically designed kitchen with two separate but equal halves for storage and preparation. Because space and money usually are a concern, you will want to create the most functional space that provides the elements to follow your personal level of dietary observance. Organization and storage follow personal preference. You may prefer to locate your dairy items (as a group) separately from your meat items or mix and match by work centers, i.e. meat utensils on one side of the cook top and dairy on the other. The mix and match option usually provides a more efficient use of your time–which is also very desirable. Separate pot and dish storage with at least one for dairy. two separate sinks or double bowl. Ovens – double, two singles or stove with a separate oven. Cutlery and utensil drawers – double or an extra for dairy. Separate pot and dish storage with at least one for dairy. .
Kosher kitchen with two separate ovens for dairy and meat use. Nonetheless, this option is not always practical for financial or logistical reasons, and therefore the issues raised in this article must be addressed. Read more at OU Kosher – Is your oven Kosher.